A set of 10 M-class bobbins. 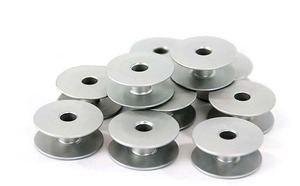 These are made of a high-quality aluminum and will work with most longarm quilting machines. These large M-Class bobbins are designed to hold more thread than a regular bobbin, letting you quilt longer without needing to change it. They come in a pack of 10 bobbins and are made of a high-quality aluminum. These will work with most longarm quilting machines.